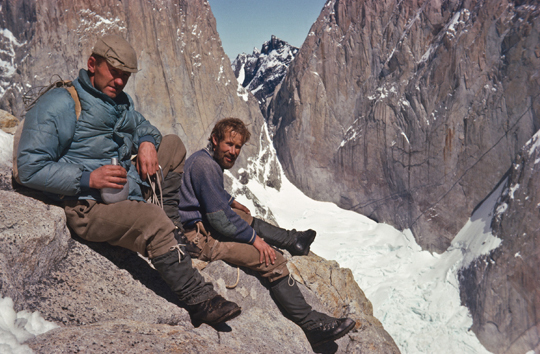 Don Whillans and Sir Chris Bonington at the base of the Central Tower of Paine (2460m), Torres del Paine, Chile, in January, 1963. The team completed the first ascent of the tower via their route the Bonington-Whillans (IV 5.11 A2, 700m). Read more about the Central Tower here. [Photo] Sir Chris Bonington collection. Use agreed in connection with Chris Bonington Piolets d'Or award 2015 only. 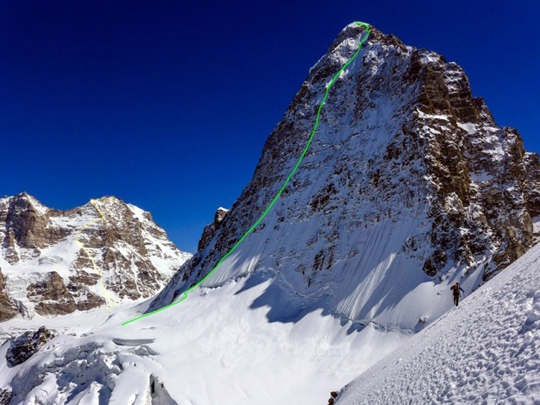 In advance of the Global Alpinism Meeting and awards ceremony to be held�April 9-12 in Chamonix, France, and Courmayeur, Italy, the three climbs slated to receive the Piolets d'Or have been announced. The awards, now in their twenty-third year, are a joint effort between Montagnes and Vertical magazines, Niveales Publishing, the Groupe de Haute Montagne [GHM], and the townships of Chamonix and Courmayeur. The new format marks a departure from tradition for the Piolets—previously, the recipients were not revealed until the ceremony itself. Chris Trommsdorff, president of the GHM, says that the change was made in the spirit of the event being "not a competition, but a celebration" of modern alpinism, and that the Piolets are likely, upon further review, to continue in this direction. This year, nine judges from nine different countries sat on the selection committee: Kazuki Amano, from Japan; Valeri Babanov, from Russia; Herve Barmasse, from Italy; Stephane Benoist, from France; Andy Houseman, from the United Kingdom; Michael Kennedy, from the USA; Ines Papert, from Germany; Raphael Slawinski, from Canada; and Andrej Stremfelj, from Slovenia. Each of the ascents chosen took place in 2014. * The traverse of the Fitz Roy group, from north to south, by the Americans Tommy Caldwell and Alex Honnold from February 12-16, 2014. This five-kilometer ridgeline involved summiting Aguja Guillaumet, Aguja Mermoz, Cerro Fitz Roy, Aguja Poincenot, Aguja Rafael Juarez, Aguja Saint-Exupery and Aguja de l'S, and featured close to 4000 meters of vertical gain with difficulties to up 7a (5.11d) C1 and ice at 65 degrees. * A first ascent from April 27-May 3 on the 1620-meter south face of Thamserku (6618m) in the Khumbu region of Nepal by the Russians Alexander Gukov and Alexey Lonchinsky. On their new climb, Shy Girl (Russian 6A/6B), the pair climbed steep ice, mixed sections of M4-M5 and four pitches of A2, making six bivies en route to the summit. * A first ascent from September 29-30 on the 1350-meter north face of Hagshu (6657m) in the Kisthwar region of India by the Slovenians Ales Cesen, Luka Lindic and Mark Prezelj. 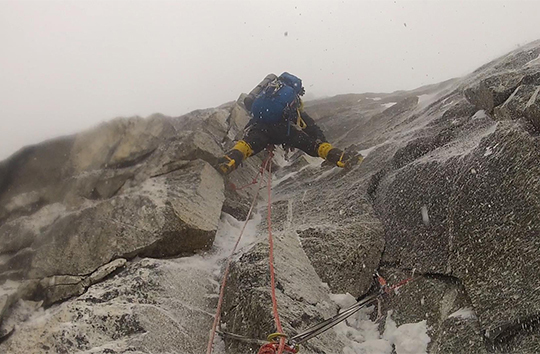 Their 1350-meter climb was graded ED, with ice at 90 degrees. 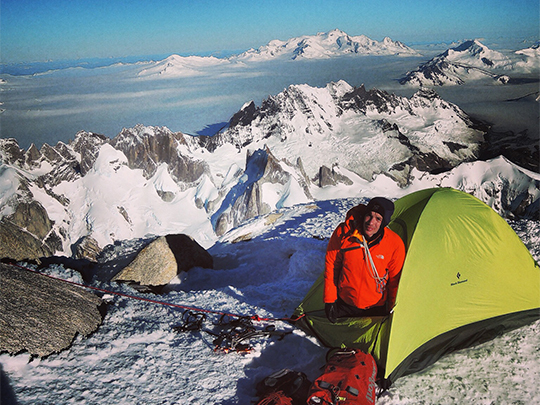 On their first day on the wall, the climbers pushed through until 2 a.m. before stopping to bivy. 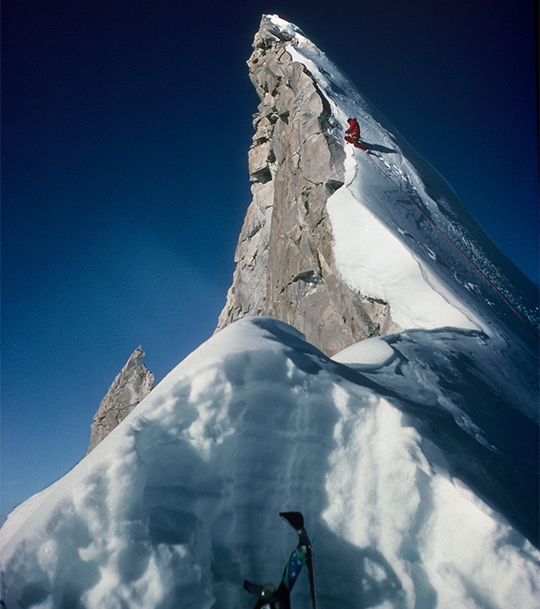 Bonington making the first ascent of Shivling, Gangotri (6501m), 1983. [Photo] Sir Chris Bonington collection. Use agreed in connection with Chris Bonington Piolets d'Or award 2015 only. In addition, the UK mountaineer Sir Chris Bonington will be receiving the the Piolets d'Or Lifetime Achievement Award, only the seventh recipient in its history. Bonington, climbing since 1951, has�many significant climbs�to his name�including the epic first ascent of�Baintha Brakk ("The Ogre") with Doug Scott.�He also led the legendary�expeditions that made the first ascents of Annapurna's South Face and the Southwest Face of Everest. Last year, at age 80 and with Leo Houlding, Bonington re-climbed the Old Man of Hoy, the demanding 450-foot Scottish sea stack he'd made the first ascent of with Rusty Baillie and Tom Patey in 1966. View the list of major ascents considered for the Piolets d'Or compiled by Claude Gardien, from Vertical Magazine, and renowned mountaineer Lindsay Griffin here.